I am happy to start today a GIVEAWAY collaboration with BaBaSSu. 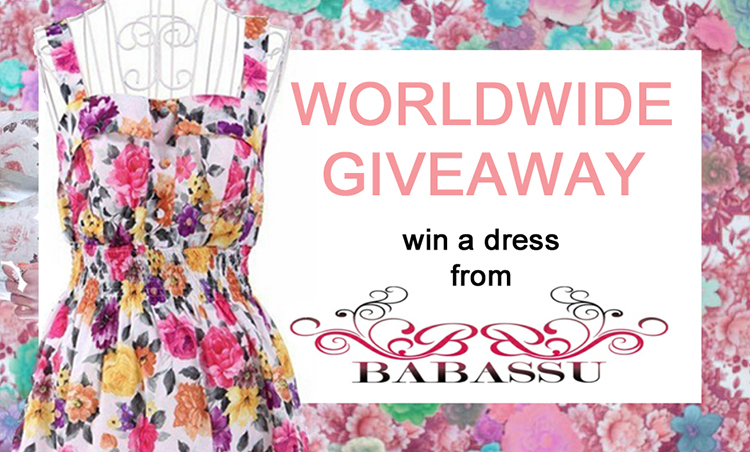 BaBaSSu offers you the chance to choose and to win the dress YOU WANT! Go on the website and choose the dress you like right now – CLICK HERE! So, are you eager to win a lovely dress for yourself? 1. You have to become my follower through GCF, BLOGLOVIN and FACEBOOK. 3. Leave the comment with a link of your FB or TWITTER where you’ve put the link to the post. Don’t forget to leave your e-mail address, your full name, the dress ID you chosen and your size. Leave your ENTRY between 14 – 30 of JUNE. Wish GOOD LUCK for everyone, my little birds!!! Thank you, GIRLS! Happy to see you here. I invite you to have a look on our giveaway and to participate. It takes just a minute! Kisses!!! Thank you very much for your warm words! Super! Thank you to have visited my blog and left your nice comment! I decided to follow you via Bloglovin. Hope you will follow me back if you really like my style. ricambia se ti va .. Hi!! !What a lovely Giveaway! I follow you and I hope you do it back! Lovely giveaway, i don't need the gift, so i'll let someone else win it. Your blog is great and i am now following it, hope to see you on my blog. Ti seguo su bloglovin, facebook, GFC e Chicisimo.. Enter me, this is a wonderful giveaway!!!! I love GIVEAWAYS! hope to win! I've searched for more Giveaways because I would like to give my sister a gift for her birthday this coming June 20. I really really hope to WIN! I forgot to mention the colour: could it be in pink? Thank you. following through GCF, BLOGLOVIN and FACEBOOK. I like your blog and I'm your newest follower! :) I'd be happy if you decided to follow me back, too! GIRL thank you so much taking part in this Giveaway! It is close now and the winner is PRISCILLA!!! CONGRATULARIONS PRISCILLA! Let us know about you!